Join ECE Undergraduate Ambassadors for a tour of the facilities available for students in electrical and computer engineering, and learn what to expect as a student in our department. Every 1st and 3rd Friday of the month (starting back again in September) at 1 p.m. Meet in the Engineering Building II lobby West. NOTE: As the semester is ending, there are no more ECE tours offered until September. The best way to find out if the College of Engineering at NC State is right for you is to visit our College and participate in one of the information sessions that we offer to prospective students and their families each week. The annual College of Engineering Open House is the best way for prospective students and their parents to learn about engineering at NC State. All are welcome. Though registration is not required, we would love to know that you are coming. You can park all day on Centennial Campus in the Partners Way or Centennial Campus Parking (Oval West) Decks. Take a look at Engineering Building II and some of what was on display at Open House, including the MakerSpace, Senior Design Center, Embedded Systems, FREEDM, ASSIST, and EcoPRT. Missed Open House at NC State ECE this past Saturday? We got you covered – here's a quick tour of some of what was on display in Engineering Building II. 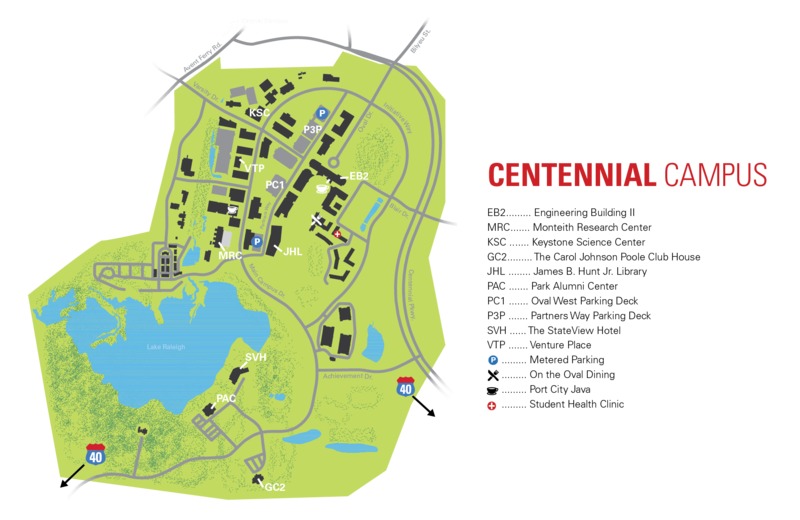 Centennial Campus visitors have the option of using either paylots or pay-by-space parking. Partners Way Deck, which is conveniently located across from Engineering Building II, has been converted to pay-by-space operation. The pay station accepts debit and credit cards but not cash; fees are $2 for the first hour (or any portion of the hour), and $1 for each additional 30 minutes (or any portion). A new method of payment is Passport Mobile Pay, a third party parking payment system which allows users to manage their parking from their mobile devices. With the Passport mobile app or the voice system, users can extend parking remotely without returning to the parking lot. For more information about parking, please visit the NCSU transportation website, call 919.513.0530 or send an email to the Centennial Campus Information Booth.